NFL players, NBA standouts and celebrities are taking to social media to tell the world how they really feel following criticism from President Donald Trump on Sept. 22. During a speech in Alabama, Trump said that he wished players who participated in pregame protests would be released and called for fans to walk out of stadiums. He later called out Golden State Warriors guard Stephen Curry in a tweet and revoked the championship team’s invitation to the White House. It all started last season when former San Francisco 49ers quarterback Colin Kaepernick kneeled during the national anthem to bring attention to racial inequality. 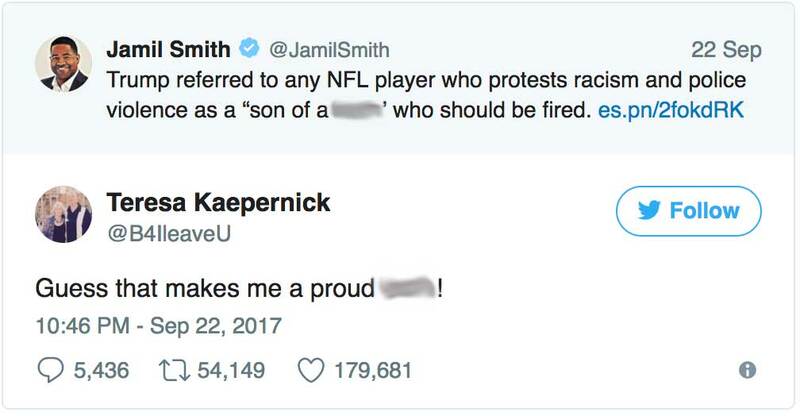 Now players are openly speaking up regarding Trump’s words and even others who have mainly stayed quiet are supporting Kaepernick’s protest. On Sunday, several teams and even the anthem singer Rico Lavelle took a knee and raised his fist after performing at the Detroit Lions and Atlanta Falcons game. By 10 a.m., 16 NFL teams had issued either a comment or statement about Trump’s remarks. Stevie Wonder just took a knee at the 2017 Global Citizen Festival in Central Park.